The Fern and Mossery: Fernseed Tequila Terrariums Take Over! Fernseed Tequila Terrariums Take Over! 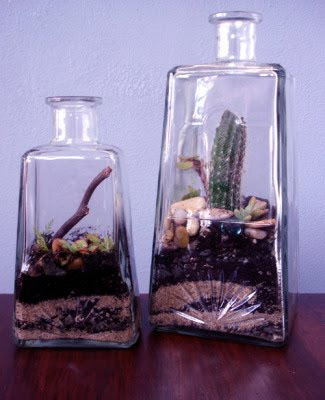 I'm seriously coveting these behemoth tequila bottle terrariums from the always-innovative fernseed. Got to love that cactus! And the price is right if you are the terrarium-buyin' type, pardner. YEE-HAW! oh i love terrariums! these are so cute, i just might have to get one! Same here. I love the tequila bottles! What a great idea, rather then recycling them, very cool. Check out my lichen for terrariums, they a very natural from pristine Rocky Mountains, and hand picked by moi! Hi. Many tequila bottles are made with recycled glass, hence they do not get recycled... We figured repurposing them helps the environment a bit, heh? I must admit, I was a bit in shock when a customer brought in the extra large bottle. Good to know he drank all the tequila, not me!